The Smallholder Farmers Alliance (SFA) and partners plant cotton seeds to reintroduce cotton to Haiti after a 30-year hiatus. Tree seedlings, transplanted elsewhere after the ceremonial planting, symbolize the unique connection between trees and cotton in the SFA/Timberland agroforestry model. 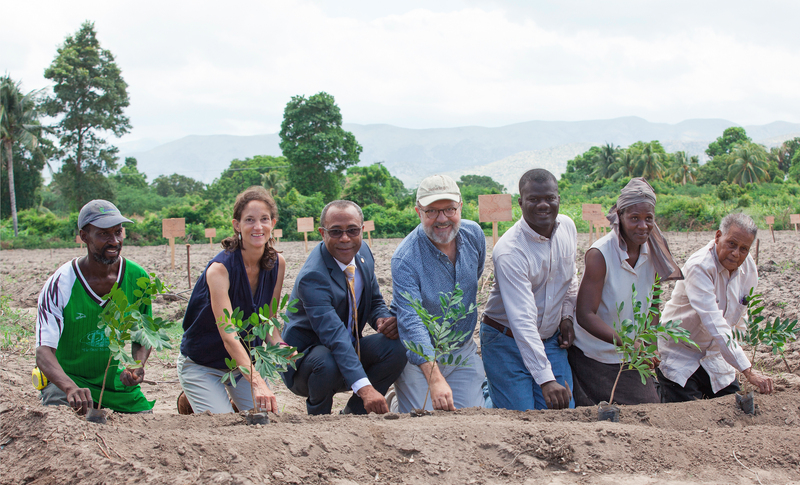 Pictured (left to right): Thony Thomas, smallholder farmer; Atlanta McIlwraith, Timberland; Pierre Marie Du Mény, Haitian Minister of Commerce and Industry; Hugh Locke, SFA; Timote Georges, SFA; Nerlande Dautarn, smallholder farmer; Rémillot Léveillé, agronomist who is known as the “father of cotton” in Haiti. Photo credit: SFA/Thomas Noreille.